This document will tell you a little bit about the MP3 files that are available in this directory for you. Those who are looking for the two commercially released Judee Sill albums will be pleased to hear that, for the present time at least, they are available from Rhino in a two-disk set called "Abracadabra," available at the moment only in the UK. However, you can pick it up for a reasonable price from Amazon.uk. (I think it's also available from Amazon's US site, but at a slightly higher price.) Those are certainly the best place to start an exploration of her music. Another album is now available which consists of rough demos she recorded a few years later for an album she never got to make. The copyright holders for that release have requested the removal of those files from this site, which is why you can no longer find them here. At the time I posted them, they were long-forgotten artifacts from a long-forgotten career, and no one much knew or cared about them. Perhaps due to the existence of this site, they've been given a chance at a wider audience, and for my part in that, I have nothing but pride. MISCELLANEOUS OTHER BBC APPEARANCES, mostly thanks to Allan Allcott. The audio quality of these ranges from poor to very good. "IN CONCERT," BBC-TV April 1972. Obviously, if anyone has actual videotape of this show (or better quality audio), I'd love to hear about it! This was recorded from a TV speaker using a microphone, and so the quality isn't terrific, but I fiddled with the EQ and it's not as bad as you'd expect. 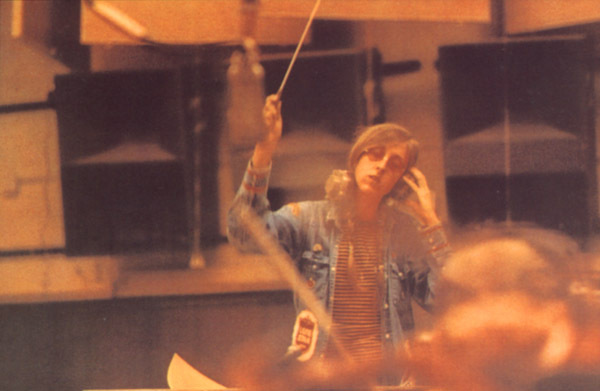 "RADIO ONE: IN CONCERT" This seems to have been recorded on February 14th, 1973, and broadcast on March 12, 1973. Thanks to Mike Parr for the upgrade (April 2005). And two more songs from a 1973 "OLD GREY WHISTLE TEST" performance, one of which ("The Kiss") is commercially available on DVD in some countries. Hi Bob---I've been going through my ancient reel-to-reel tapes and my eyes bugged out when I saw this one song listed on a tape box. This was originally recorded on one of those old handheld portable cassette decks, the kind that sold for around $29.95 with a tiny little mic that was probably worth about a dollar, so the sound isn't spectacular but it ain't too horrible either. Apparently I transferred it to reel-to-reel tape soon after the concert. Thanks so much for sharing this, Robbie! The more investigation I did, the more I realized that the best memorial possible to Judee Sill is her songs. It's a life that's frustrating to learn about in many ways, characterized by many strokes of just plain stupid bad luck, with some foolish decisions and carelessness thrown in for good measure. So, I think it's probably better left undone. She wrote some amazing songs, and let's enjoy them and leave it at that. 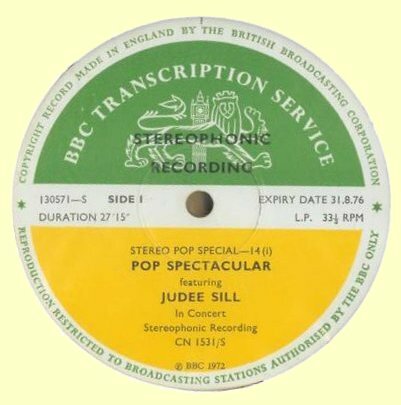 If anyone out there has any other rare recordings of Judee Sill (or cleaner copies of these), I'd love to hear them and add them to this repository. Please email me at the address below. "I have had the record reported to me by a user so i assume that they are correct. It is difficult. I have been told several times that records do not exist and in some cases i have them in my collection. I am just not too sure about this one. I have taken the record out of the database ready for the next version or update. I can not see who sent it without going through hundreds of files and letter so maybe it is better to forget it." Obviously, in the unlikely event that anyone has any evidence that there ever really was such an album, I'd love to hear about it. Until then, I'll continue to maintain that it's either a clerical error or a prank. On a completely unrelated bit of self-promotion, if you'd like to download or listen to my radio shows, check them out here. I hope you like them!